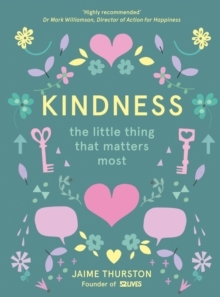 Kindness - the little thing that matters most aims to motivate and inspire by showing readers what a difference even a small act of kindness can make. It uses the voices of those who have been helped by the author's charity - 52 Lives - to ground the ideas in real life action. The book is themed around 52 simple actions you can do to spread kindness. Interspersed throughout are nuggets of science explaining the positive effect kindness has on the brain and on the heart. This book is a call to action for people to live a more connected, fulfilling life. With inspirational quotes and personal stories this book will give you all the motivation you need to start spreading a little kindness - it's free afterall! Learn to live a life of kindness by following Jaime's infectious positivity in this charming gift book.